Disposable batteries can slow you down. They are a hassle to switch out. How many times have you dropped a battery down your bathroom sink? Additionally, when you need them the most, they always seem to die. When your life is busy, you need a hearing aid that can keep up with you. Phonak has created the Bolero B Rechargeable Hearing Aid to simplify your life, make hearing effortless, and keep you moving. The Bolero B utilizes Phonak’s unique AutoSense operating system. This technology automatically senses your surroundings and adjusts your hearing aid accordingly. Turn them on and enjoy the sounds of the world around you. Not only is your hearing effortless, charging your device is just as simple. Phonak’s Bolero B houses a specifically designed built-in lithium-ion rechargeable battery. Gone are the days of disposable batteries that are small and hard to handle. You can enjoy up to 24 hours of hearing on a single charge. Choosing a hearing aid is a personal decision. At Bravo Hearing, we will help you decide if the benefits of using the Phonak Bolero B Rechargeable Hearing Aid are well-matched to your needs. Charges quickly, lasts longer – With Phonak rechargeable technology, a 3-hour charge of the Phonak Bolero B gives you 24 hours of hearing. When you are in a rush, just charge the hearing aid for 30 minutes and enjoy up to 6 hours of full performance. Phonak Charger Case – This is an all-in-one charger, drying kit, and protective hard case with an included cleaning tool. 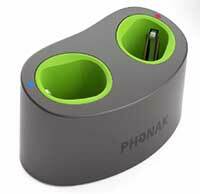 Phonak Power Pack – Attach this power pack easily to your Phonak Charger Case. You will find it is ideal for short trips with no available source of energy. Phonak Mini Charger – A compact charging option. Fully automatic listening – AutoSense OS technology adapts to your surrounding environment. It identifies when you are in a noisy restaurant or at home, in a concert hall or in a car. The Bolero B hearing aid monitors and adjusts seamlessly for you. Enjoy the best quality of sound in all of your environments. No more need to manually adjust your hearing aid. Hear and understand more in the middle of the noise – With the AutoSense OS technology, you can hear a 60% improvement in speech understanding. It hones in on a single voice in a noisy environment, cutting out all the murmuring in the background. Hear quiet voices again – You can hear soft voices better with the Bolero B rechargeable hearing aid. No more struggling to hear your grandchild’s voice. For over 70 years, Phonak hearing aids have improved the quality of life for their customers. The Phonak Bolero B Rechargeable hearing aid is no exception. A hearing specialist can sit down with you to discuss how Phonak rechargeable technology can keep your life moving at a comfortable pace. 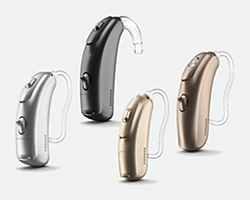 The Phonak line of hearing aids is a strong reflection of Phonak’s mission. Deciding if the Bolero B is the right choice for you is best made with a professional hearing specialist. At Bravo Hearing, we will be happy to sit down and discuss your options. To learn more about Phonak hearing aids, call the experts at Bravo Hearing Centre today at 647-694-4626. We can arrange a complimentary consultation at your earliest convenience. You can also book a free consultation online.